Construction is one of the biggest industries in the economy. Not only your house, your building but also other public facilities also need the touch of construction. 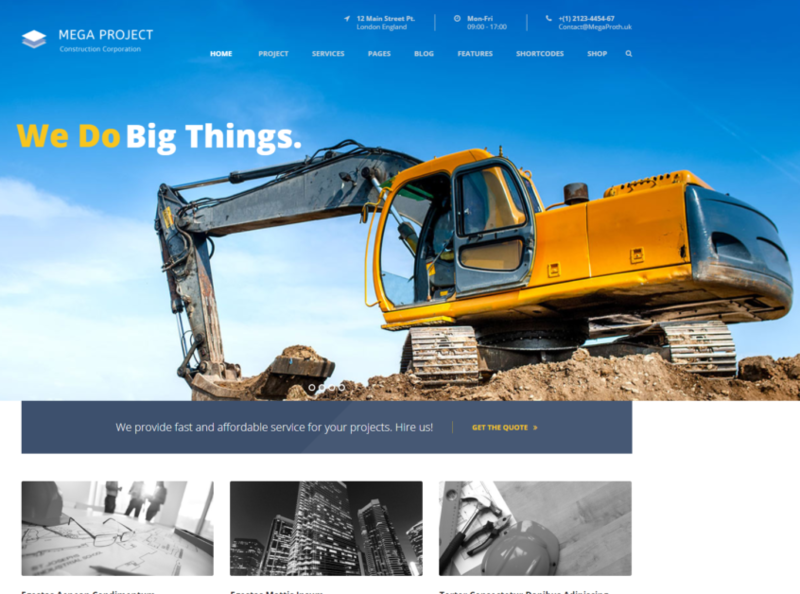 If you are looking for a solution for your construction business site, then we give you the best construction themes for WordPress to consider. WordPress is the best Content Management System on the planet. You will have the ability to create your site with our will, your purpose. Besides, it has many sources that provide resources and tools for you. For example like themes, add-ons and plugins, etc. Especially, Theme is the most important factor for a WordPress site. It’s the base fundamental for you to build your website on it. 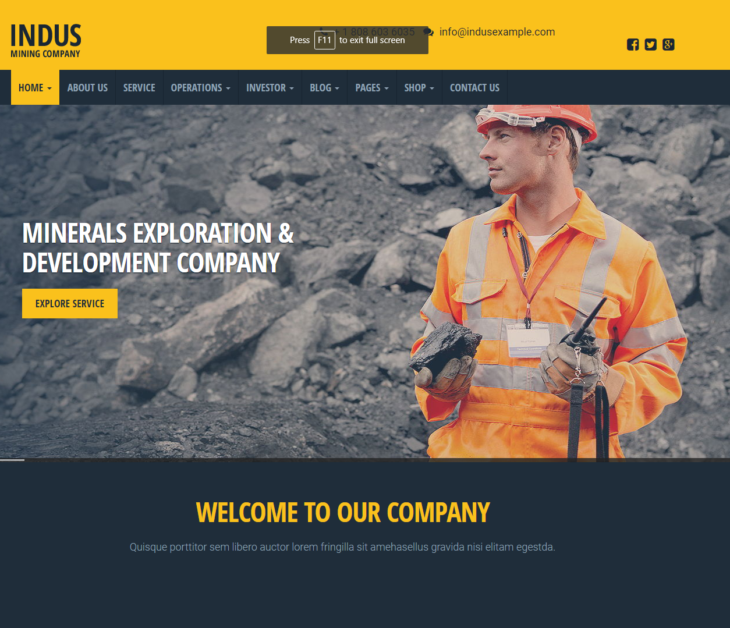 With the aid of the best construction themes, your construction business site will be awesome. These themes are attractive, look nice, deep customizable, user-friendly, easy to use with drag-and-drop, support galleries for your construction work, blog and press releases, etc. Today, we will take a tour through those bests with you. 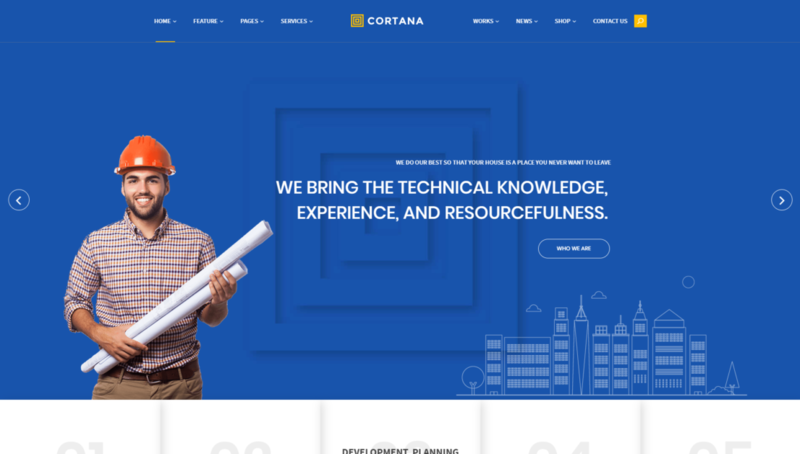 This is considered the best Construction WordPress theme. MegaBuilder is an innovation of Construction WordPress themes. Beautiful Revolution slider will impress your customer when they enter the site. With many other elements and widgets, you can put up many designs and layouts. Express your creativity and maximize your site’s potential. Moreover, you will have variety gallery to show off your works, certificates and trophies. 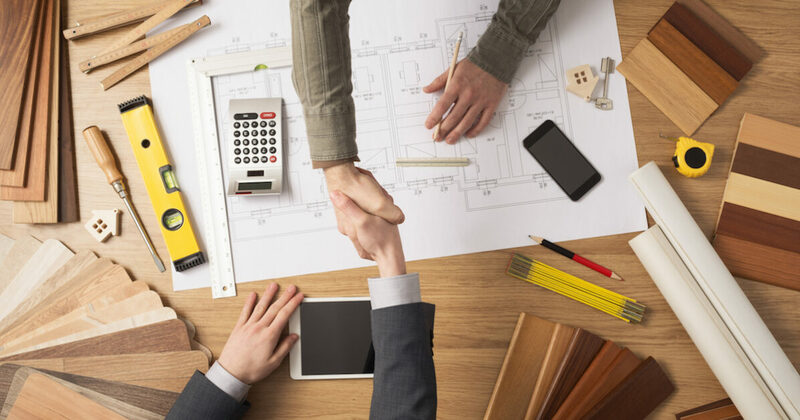 MegaBuilder not only present your amazing construction business, but also promote your career and gather more clients to come for your company. MegaBuilder is built to be fast. With SEO optimized construct, the theme runs smoothly and fast in any environment. Besides, it can also have cached, call-to-action, sitemap, and more. These are the factors that push your construction site to the top in any Search Engine like Google or Bing. Furthermore, the theme is very easy to customize. Used WP Bakery visual composer, you can drag-and-drop any elements and contents, live-edit any page, witnessing the changes immediately. The page builder also integrated with many other awesome shortcodes from ThimPress. Thus, you will have unlimited possibilities to create your Construction Empire. 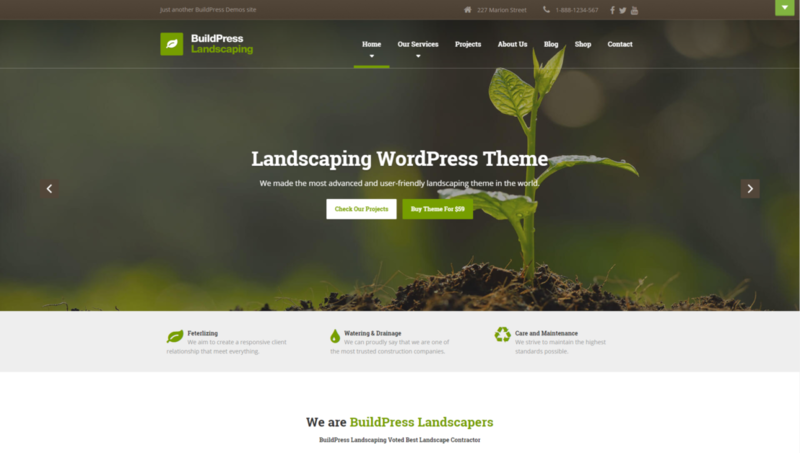 BuildPress is one of the most successful construction themes for WordPress. It made approximately 7,000 sales. It comes with many amazing features such as live preview, one-touch demo import, pre-built demos. Moreover, another big feature of BuildPress is Real-time WP customizer and Page Layouts. It means what you change, you can immediately preview it without reloading the page. Also, Visual Composer and Page Builder is coming along inside the theme. So, you can drag-and-drop contents and customize your page with ease. Besides, BuildPress has sidebars and widgets supported, it gives you the unlimited capability to create your unique page layout. Furthermore, BuildPress includes Essential Grid Gallery Plugin. It’s the place for you to show your company’s portfolio and construction works, a way to promote your business. Speaking of promoting, BuildPress is also compatible with WooCommerce. You can build a shop on your site to sell your things! Many other popular plugins are also supported, such as Contact Form 7, Custom Sidebars, Jetpack and Fancy box. Thus, the utilities BuildPress gives you is huge. Easy page builder with various customization. Real-time customizer and page layout. A Large pool of popular plugins supported. Easy to coding for developers. 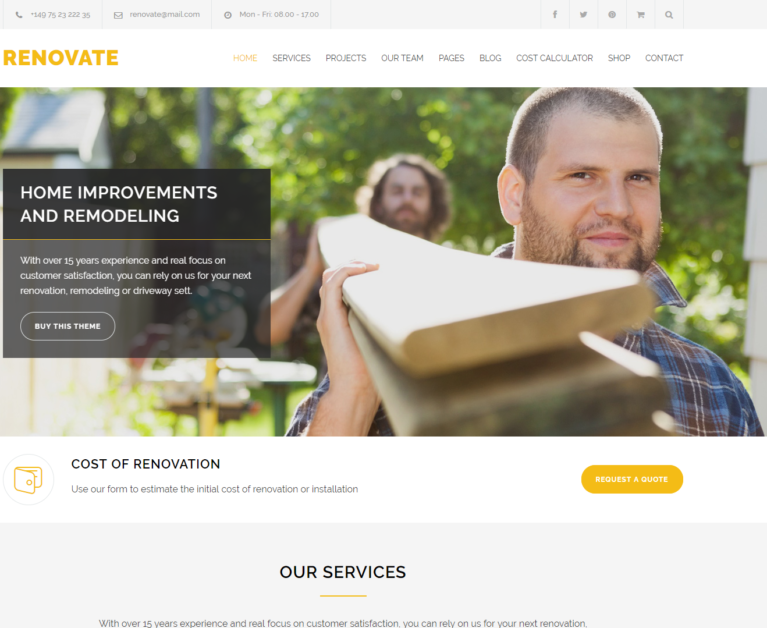 Renovate is a great and simple construction theme for WordPress. It’s mobile responsive. Your site elements will adapt flawlessly on any mobile device. Renovate also has built-in Revolution Slider inside. It is a plugin that creates sliders at your homepage, making your site lively and more attractive. 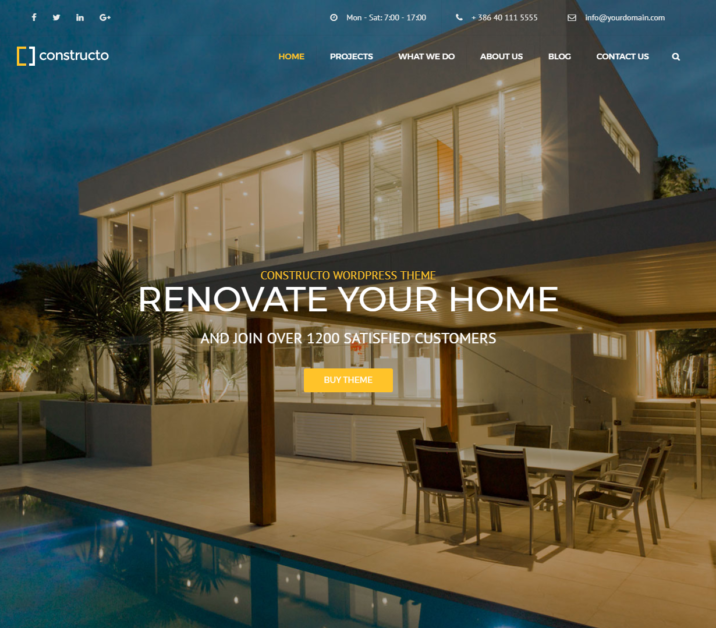 Renovate is highly customizable with drag and drop page builder, user-friendly UI and color picker. Besides, Renovate provides 50+ content elements and settings. This gives you the ability to set up your page as your will. Besides, Renovate added an amazing feature: Cost Calculation. This feature could help your clients quickly evaluate and make decision for the work. Also, they can compare between many options and consider the best choice for their construct. And, Renovate theme has a smart sticky column at the side of the page. Inside that column, many useful information could be stick on such as blogs, gallery, promotions, etc. WooCommerce add-on available with many others add-ons. 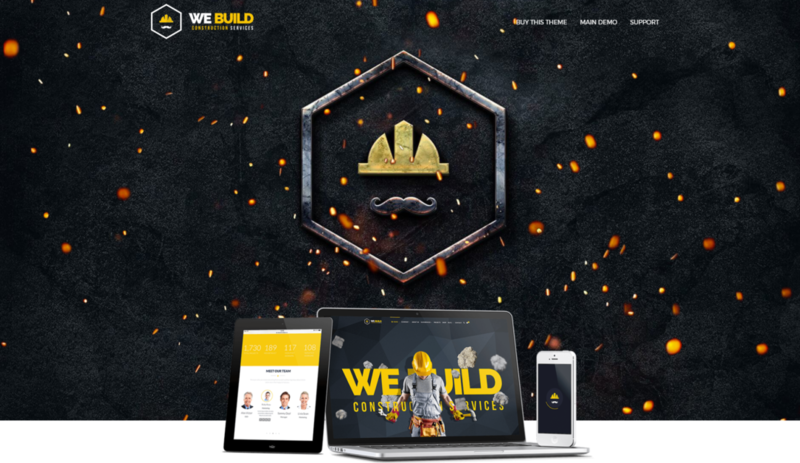 In my opinion, We Build is among the most creative construction themes for WordPress. With the gallery of 15+ unique layout concepts, you are free to choose one for you. And of course, We Build provides drag and drop and page builder. You can easily customize one and make it yours. 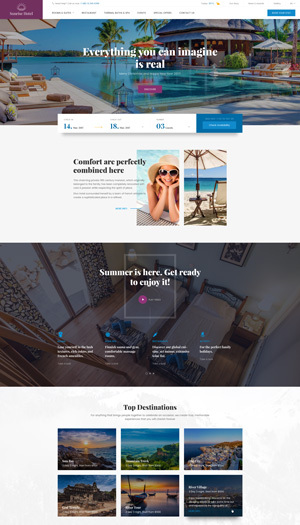 Moreover, with Visual Composer, Revolution Slider, Essential Grid, you will create your site with creativity and awesomeness. Besides, We Build is also mobile responsive and Retina compatible. It also has SEO Optimized with loading speed improvement and Yoast SEO plugin. As you can see from their demos, there are so many, many things to customize. We Build gives you the unlimited possibility for your construction theme. Furthermore, the homepage is interactive. It means when you move the mouse around the homepage, elements will interact and move as well, it’s pretty cool and exciting. The first impression: Stunning. Easy page builder with drag and drop. Interactive UI, which is very cool. Mobile responsive with Retina display compatible. 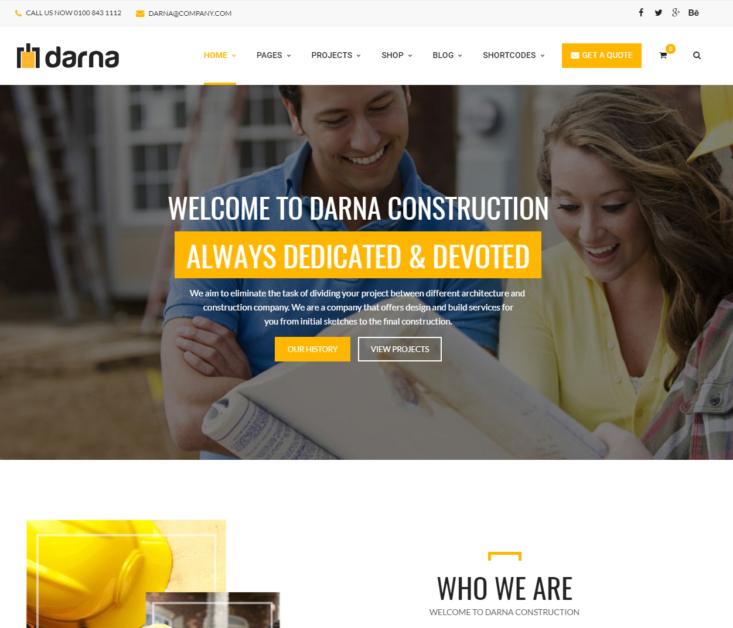 Darna is another one of the great construction themes for WordPress. Firstly, its all-in-one admin panel. Darna has an user-friendly interface with an options panel with many selections and adjusts. You can customize almost everything in the board, even the fundamental elements. Moreover, Darna supports OneClick Demo install feature. Therefore, with just a click, you can import pre-built demo of the theme into your site included post, Revolution slider, WooCommerce, other add-ons and widgets, even theme settings. Secondly, Darna is compatible with WPML. It supports building and managing multi-languages sites. Also, sidebars are highly customizable with Darna. You can create unlimited sidebars and configure them. Bunch of add-ons coming along, such as Revolution Slider, Visual Composer, WooCommerce. Redux FrameWork for Powered ThemeOptions. 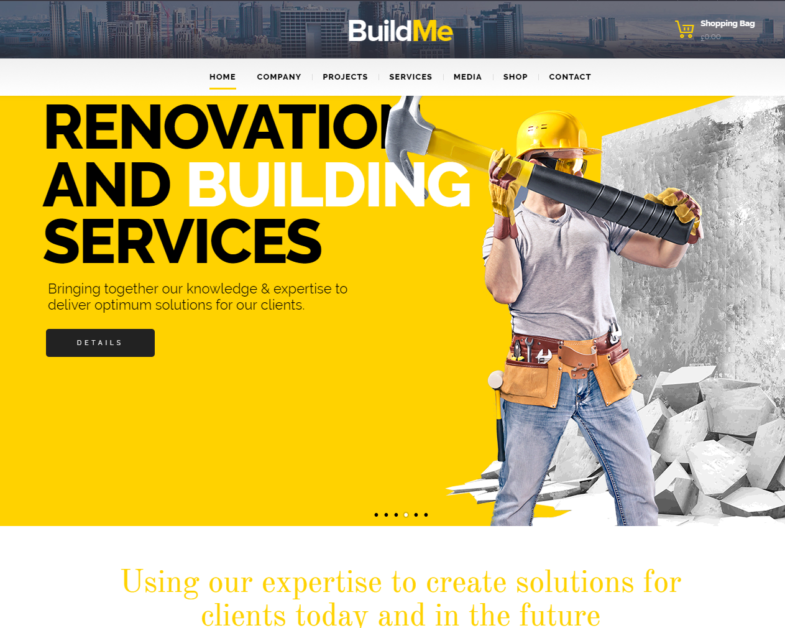 Next on the construction themes list, BuildMe is coming up. It is a simple and elegant theme. 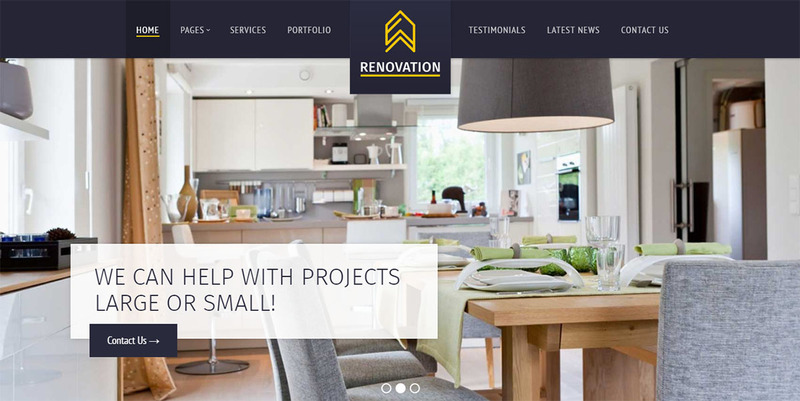 With mobile responsive feature, BuildMe can adapt to any kind of website and mobile device. The theme contains more than 12 pre-built layouts for you to use, with just one-click installation. Moreover, BuildMe integrates not only Page Builder, which will give you the drag and drop feature; but also it bundles with many other plugins. Such as WooCommerce, Revolution Slider, Master Slider and Essential Grid, etc. Those pre-built layouts will be your fundamental to build your site on. Besides, simple interface with SEO assistance will help you manage your site better. BuildMe also have multi-lingual translation for who wants to contribute, along with free support and updates to help clients solve their issues. Abundant pre-made layouts with OneClick installation. Mobile responsive and work well with Retina display. Add-ons coming along as Page Builder, Revolution slider, WooCommerce, etc. 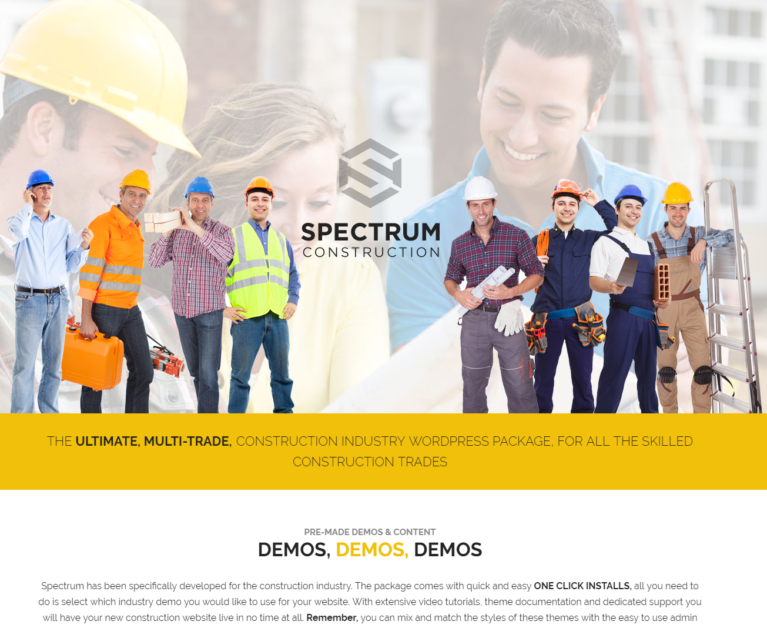 Spectrum, a Multi-Trade Business Construction theme for WordPress. Like others, it gives you the base and tools to build your site for construction business. Also, Spectrum offers 13 demos for you to consider. And of course, all of them are OneClick installed. Moreover, a bundle of add-ons is inside the theme, including Visual Composer, Revolution Slider, Essential Grid, etc. Mobile responsive with all mobile devices. Boxed or fullwidth layout customization. Shortcodes supported, so that you can easily add visuals to your site. Add-ons integrated, including Revolution Slider, Visual Composer, Essential Grid, Contact Form 7, etc. Sounds like the personal assistant bot on Windows 10, but this Cortana is one of the construction themes for WordPress, not a talking bot. First of all, Cortana support drag and drop feature and superior theme options. It aids you in creating and managing your site. Moreover, it provides Revolution Slider add-on and WooCommerce integrated. Besides, the theme supports shortcodes so you can customize your site deeper and create exclusive contents. RTL (right to left) mode for some specific language is coming along, too. Unlimited colors and google fonts. Mobile responsive and cross-browser compatible. 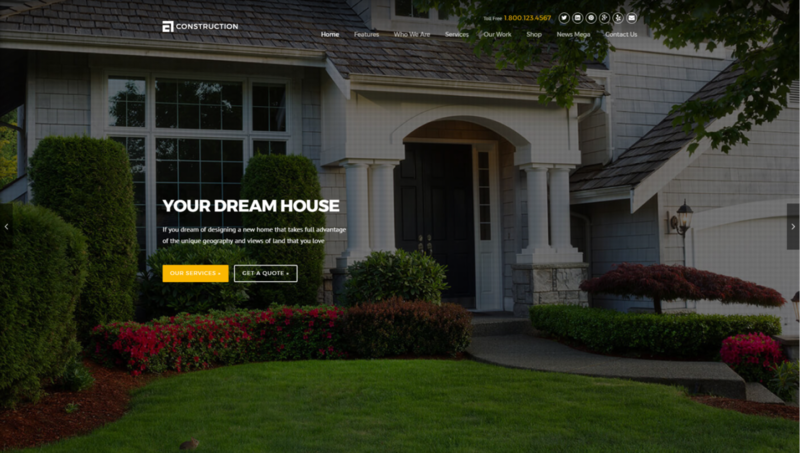 In my opinion, Construction by WPCharming is among the most beautiful construction themes for WordPress. It provides transparent header and video homepage (which I like). It’s easy to import demos and update the theme with OneClick function. Construction also supports add-ons for free such as Revolution Slider and Essential Grid. Furthermore, Construction by WPC has an advanced theme options panel, where you can navigate and control over your site. You will gain access to 600+ Google font and the color picker to customize your site, too. 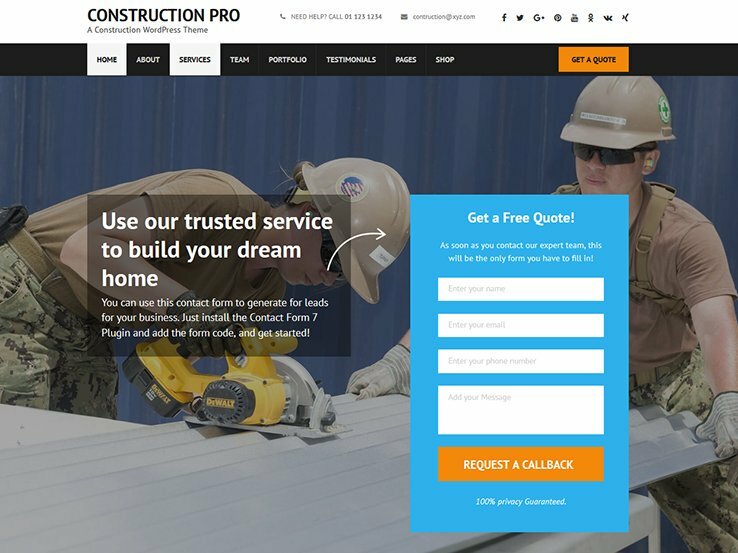 Plus, Construction has a Premium Support Service that works 24/7 for premium clients. OneClick demo importer and theme updater. Translation ready with WPML compatible. Avanter is another great choice of construction themes for your site. However, Avanter direction is not only for construction and architecture, but also corporation business and products. Avanter supports WooCommerce add-on, so you can start a shop to sell your things. Moreover, it’s mobile responsive with Retina compatible. Avanter can also create unlimited portfolios and sidebars. One more thing, Flickr widget and Photoshop File inside the theme will help you add your images easier. Avanter was built using HTML5 Boilerplate, making it a fast, convenient and powerful site. If you want construction themes with many languages supported, then StructurePress is one of them. It was fully translated into 14 languages. 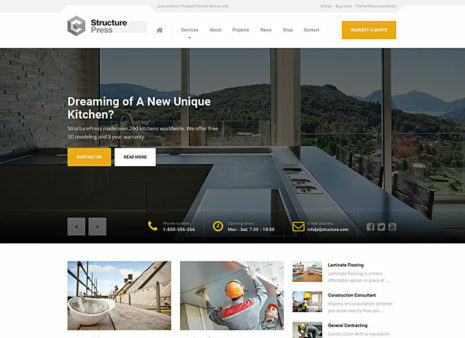 StructurePress provides the core features of a construction theme: Page builder, customs widgets, WP customizer, OneClick demo import, additional add-ons, mobile responsive with retina ready. Also, shortcodes are integrated and free Photoshop PSDs, too. Besides, StructurePress developers offer customization service after purchase. It means after you buy the theme, you can hire them to design and customize the site for you as you want. Portfolio Grid Widget for you to make a gallery. Work well with Custom Sidebars, Contact Form 7, Advanced Custom Fields, WP Rocket, Simple Lightbox, Yoast SEO and WooCommerce. Other Construction themes for WordPress that are great! Above are the best construction themes that I want to show you. All of them support basic features for you to build your page. For example, drag-and-drop Page Builder, Revolution Slider, Essential Grid, WooCommerce compatible, mobile responsive and retina ready, powerful sidebars and options panel, etc. Some have transparent elements to make your site look nicer. Each gives you the capability to create your unique site. To grow your business and win customers, you should have an unique personalized site to promote your work. Make sure your customer can find you, and you can find them. Show them what you got, make them remember you. And a website is one of the best places to do those. Let’s grab a theme and start promoting your business now!